Sheet piling retaining wall, including cantilevered sheet piling retaining wall and retaining wall entirely rely on the depth of the wall to maintain the stability of supporting sheet piling retaining wall. Cantilever sheet piling in the pile to Reach a steady state due to a long time, and in many cases, only the heavier sheet piling to reach the design depth, and thus relatively low in the retaining height of the project using cantilevered retaining soil Walls are more economical. In addition cantilever Retaining wall deformation is greater. Soil characteristics, retaining height and groundwater around the wall of the cantilever retaining wall has a great impact on the design of permanent retaining wall to pay special attention to set the cap beam is operative to improve the positioning accuracy. The supporting sheet piling retaining wall, whether anchored or supporting role in the sheet piling on the force by the anchor or support shared. Therefore, the stability of the retaining wall is not as important as the cantilever retaining wall. 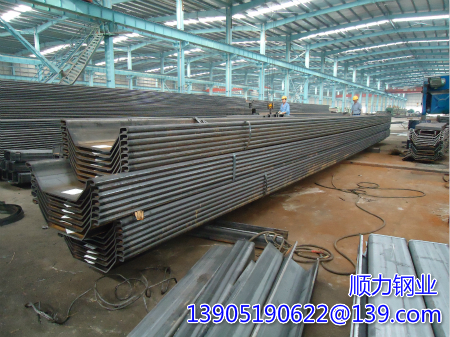 Sheet pile can be transferred to the tie rod or support by the purlin. Cantilever retaining wall height is generally controlled by wall deformation. Since the wall deformation is related to the bending of the wall itself and its movement, regardless of the wall type, this applies to all flexible walls. In general, when the retaining height of more than 4.5 ~ 5.0m in time, the cost of cantilever retaining wall will be higher than the support type. This is because cantilever retaining walls need to have sufficient length and strength to maintain stability. Single-support sheet piling retaining wall maximum economic retaining height of about 10m. If more than one support, the stability of the board and the support will be related to the stiffness, this time, the traditional passive and passive earth pressure distribution is no longer applicable.